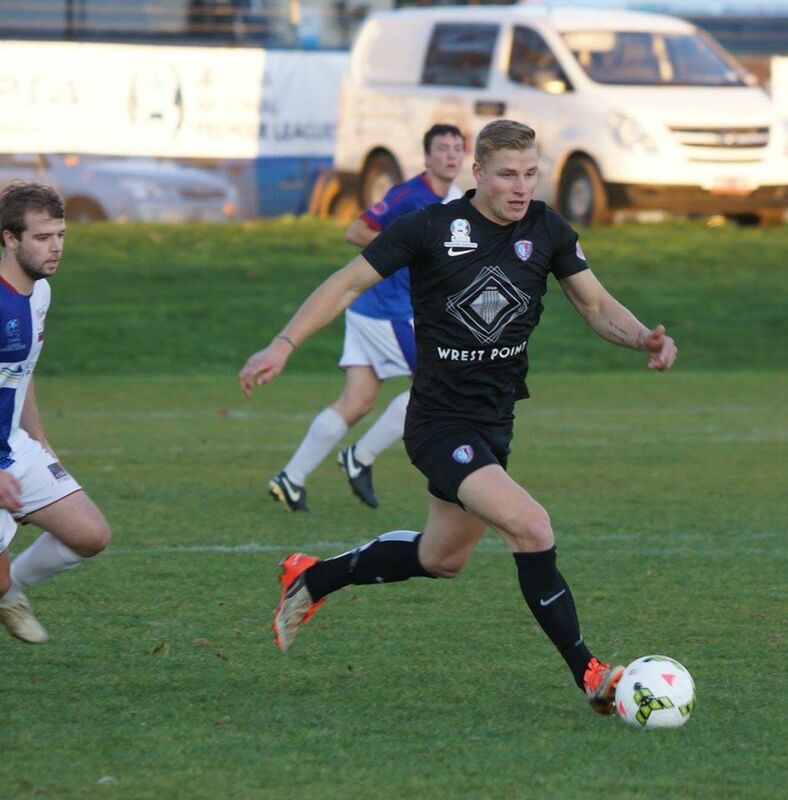 A ten-man South Hobart outlasted a ferocious Northern Rangers comeback and claimed all three points on the road to cement them firmly in 3rd place on the PS4 NPL Tasmania ladder, running out 3-1 winners over their northern counterparts at the NTCA ground. South Hobart were the better side on the evening but that should not discount the gutsy and determined performance Rangers, after a week mired by controversy. The game turned in Rangers’ favour when defender Daniel Brown was sent off for a last man challenge, but South Hobart showed their class by not just surviving but also adding to the scoreboard. The last time these two sides met in Round 3 in early April at Darcy St, South Hobart dispatched of the travelling Rangers side 12-0. Rangers were desperate to put that result behind them with strong showing in front of their home crowd but it was always going to be tough against a South Hobart side that had amassed a league high 50 goals this season, whilst the Rangers had conceded a league high 36 goals. Further compounding of Ranger woes, was the shock resignation of head coach, Dane Hudson, mid-week with ex-goal keeper for club, Marshall Pooley, announced as the temporary replacement, giving him the reigns of the Rangers side for the Round 10 clash. From the first whistle Rangers were trying to settle themselves by being patient and playing out from the back but the pressure that came from South Hobart pressing the Rangers ball carriers was immense, forcing Rangers to turn the ball over in dangerous positions. This meant that for the first 30 minutes of the game South Hobart would dominate possession and territory, and Jack Turner & Nick Morton were key performers, getting into good positions, and distributing the ball cleanly. Rangers were looking to hit on the counter attack through the pace of Geoffrey Wani. South Hobart was rewarded for their dominance in the 11th minute, when Nick Morton crossed the ball along the ground from the right wing to a waiting Jack Turner at the top of the 18-yard box. Turner composed himself and smashed the ball into the bottom right hand corner of the net leaving Rangers keeper, Luigi Cordova with no chance. Turner then doubled his tally and the South Hobart lead just five minutes later in the 16th minute, when an Alex Leszczynski free kick crashed into the cross bar and ricocheted to a waiting Turner who was the first to pounce on the stray ball. Cordova was still recovering from his attempted save of the free kick and wasn’t able to prevent him from adding his second. He would finish the game with brace and a best on ground performance. South Hobart were cruising to victory, but the game was turned on its head in the 3oth minute when a Rangers counter-attack found Wani with just Daniel Brown and the goal-keeper to beat. Daniel Brown’s tackle was errant and referee Stewart Reid, gave him his marching orders for the last man tackle. The resulting free kick was taken just outside the edge of the 18-yard box by Rangers full-back, Tenzing Anderson, who has already scored from a free-kick this season. And indeed, Anderson capitalised on the game and cut the Rangers lead in half in the 31st minute with an excellent strike that soared into the vacant right hand side of the goal. Suspect wall placement aside, there was nothing James Wilson could to prevent his goal from being breached, and Rangers were back in the contest with an extra man to boot. Rangers were buoyed by the goal and by the advantage of the extra man, and in the remainder of the first half the game opened up and was played in a free-flowing, end to end, back and forth style. But neither side were able to create any clear-cut opportunities. Harry Thanhausser & Bruce Bown were instrumental in the Ranger comeback. At half-time South Hobart were left to re-organise and re-strategize. They had reacted quickly to re-shape themselves for the end of the first half in the wake of Brown’s dismissal, and their defensive unit was tight. And South Hobart striker, Alex Leszczynski, as always, looked dangerous both and off the ball, getting into excellent positions, and providing a headache for the Rangers’ man mountain in centre defense, Jorge Palacio, who had a strong first half. Their battle was one that would determine the outcome of the game. The second half brought with it nightfall and a drop in temperature. The glow of the light towers and the warmth of the liquor seemed to amplify the verbosity of the crowd. South Hobart took a more measured defensive approach to the start of the second act, opting to not press the ball carrier as intensely in the second half to preserve energy. This allowed the Rangers midfielder’s, in particular Nick Lanau-Atkinson & Thannhausser to control the midfield and the game for much of the second half as they chased game looking for an equaliser. In the 71st minute, James Wilson made an outstanding save to deny Nick Lanau-Atkinson. Kobe Kemp was caught with ball in defense trying to play out from the back. After laying the tackle and winning the ball Lanau-Atkinson found himself, one on one with the keeper at a difficult angle. His shot was headed for the bottom right hand corner of the net, but Wilson saved low to his left to deny Rangers an equaliser, in what was their best chance of the second half. In- the 73rd minute, Alex Leszczynski broke the shackles of Jorge Palacio, and put the game beyond doubt, when he scored a glancing header from a free kick to bring his tally up to 14 for the season. The free-kick was taken 25 yards from the goal line out on the left wing just inside the touch line. The ball was curled in toward the keeper, and Leszczynski’s run toward the ball was unchecked and he simply re-directed trajectory of the ball slightly to send it over the head and hands of Cordova, to make it 3-1 in South Hobart’s favour. And that was how it finished, as neither side would trouble the scorers in the final minutes of the game. Rangers were left a little flat-footed after conceding and South Hobart managed the final minutes of the contest comfortably. After controlling a large portion of the game, Rangers would be disappointed that they couldn’t find an equaliser, but that does not take away from their performance after an intrepid comeback will have people talking about their on-field performance rather than their off-field troubles. It was a much closer game than many expected. But full credit must be given to South Hobart for a professional display, in which they were troubled but never dominated. Despite Brown’s sending off, South Hobart re-adjusted and managed to keep Rangers to one goal, and scored one of their own in the period of time they were down to 10-men. For South Hobart, it was best on ground performance from Jack Turner, who collect a brace and was pivotal in the midfield contest. For Rangers, it was an excellent team effort, and the performances of young players Matthew Youd and Jesse Fulton in midfield will give Rangers supporters something to look forward to in future years, as they both continue to adjust well to top flight football in Tasmania. Rangers, still in 8th place on the ladder remain one point behind Kingborough Lions in 7th. And indeed, Rangers will invite the Lions to the NTCA ground in Round 11, and will look to claim their first win of the season. South Hobart will return to Darcy St in 3rd place and play host next week to Launceston City. South Hobart were comfortable winners in their last fixture, against each other and are poised perfectly for an assault on top position on the ladder as the PS4 NPL Tasmania season continues.